Sizes available : 1 & 2. We are actively engaged in offering the finest quality Fountain Solenoid Valve. Max. Return Flow: 350 Lpm. Max. Working pressure: 350 Kg/Cm2. - Low friction dynamic seals for better performance. - Option of gang manifolding upto 6 nos. of valves. 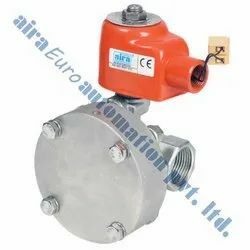 Solenoid Valve:- These products operate demanding fluid control applications. Also, these valves have multipurpose applications for air, gases, oils and liquids. We are leading Manufacture of Solenoid Valve for Gas , combustion air regulation , Multiple safety solenoid valve for gas regulating train.